Variety pack of Stinky Stickers offers a fun way to give out rewards, incentives, and collectibles. 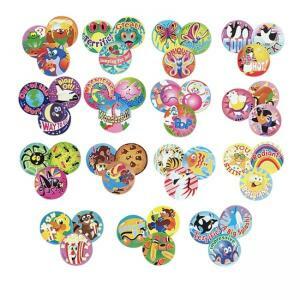 Each large round sticker has a burst of fragrance waiting to be scratched and sniffed. Stickers are acid-free, nontoxic, and safe for use on photos. Each sheet has 15 stickers. Actual sticker sheets may vary from photo. Stickers are ideal for pre-kindergarten to third-grade (ages 3 to 8).